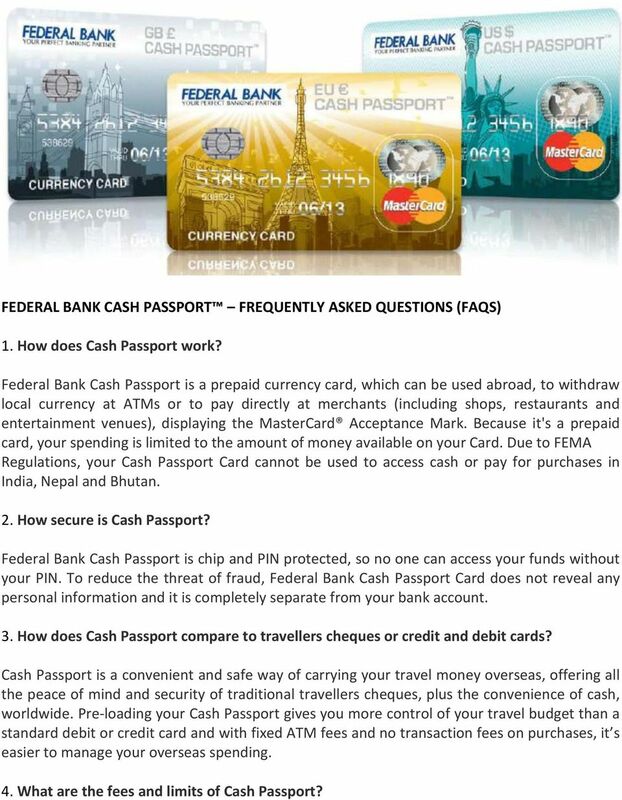 Download "FEDERAL BANK CASH PASSPORT FREQUENTLY ASKED QUESTIONS (FAQS)"
1 FEDERAL BANK CASH PASSPORT FREQUENTLY ASKED QUESTIONS (FAQS) 1. How does Cash Passport work? Federal Bank Cash Passport is a prepaid currency card, which can be used abroad, to withdraw local currency at ATMs or to pay directly at merchants (including shops, restaurants and entertainment venues), displaying the MasterCard Acceptance Mark. Because it's a prepaid card, your spending is limited to the amount of money available on your Card. Due to FEMA Regulations, your Cash Passport Card cannot be used to access cash or pay for purchases in India, Nepal and Bhutan. 2. How secure is Cash Passport? Federal Bank Cash Passport is chip and PIN protected, so no one can access your funds without your PIN. To reduce the threat of fraud, Federal Bank Cash Passport Card does not reveal any personal information and it is completely separate from your bank account. 3. How does Cash Passport compare to travellers cheques or credit and debit cards? Cash Passport is a convenient and safe way of carrying your travel money overseas, offering all the peace of mind and security of traditional travellers cheques, plus the convenience of cash, worldwide. Pre-loading your Cash Passport gives you more control of your travel budget than a standard debit or credit card and with fixed ATM fees and no transaction fees on purchases, it s easier to manage your overseas spending. 4. What are the fees and limits of Cash Passport? 2 Please visit the webpage for full details of the fees and limits. 5. What currency can I load my Cash Passport with? A Cash Passport Card purchased in India can only be paid for with Indian rupees (INR). When you purchase a foreign currency Cash Passport Card, the INR amount will be converted to the currency of your Card. The Federal Bank Cash Passport is available in three currencies; British Pounds, Euros and US Dollars. 6. Where can I use the Card? You can use your Federal Bank Cash Passport at ATMs worldwide, displaying the MasterCard Acceptance Mark. There are 1.9 million MasterCard ATMs worldwide from which you can withdraw local currency. Alternatively, you can use the Card to pay directly for goods or services at any merchants abroad (in store or online), that accept MasterCard. No matter which currency Card you purchase, the Card can still be used worldwide. For example, if you purchased a Euro Federal Bank Cash Passport, you can still use it at ATMs in America, but the balance in Euros will attract a currency conversion from Euros to US Dollars. 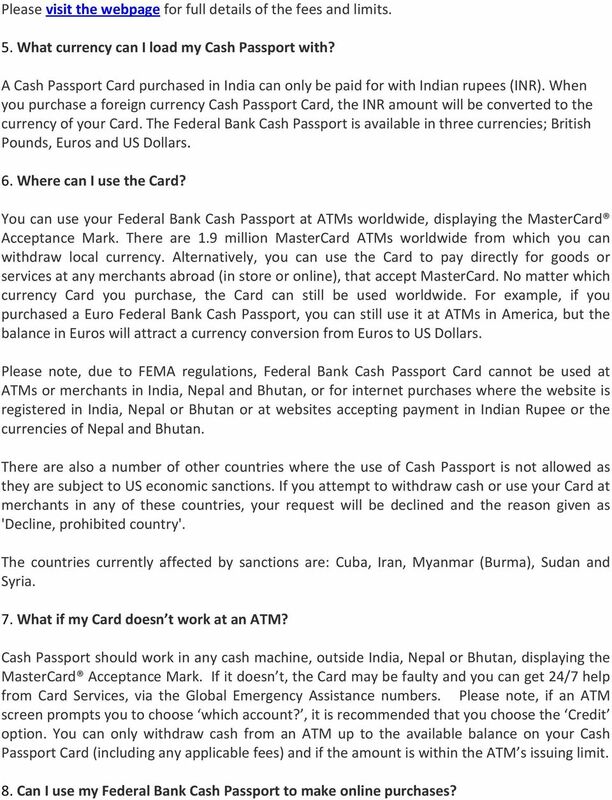 Please note, due to FEMA regulations, Federal Bank Cash Passport Card cannot be used at ATMs or merchants in India, Nepal and Bhutan, or for internet purchases where the website is registered in India, Nepal or Bhutan or at websites accepting payment in Indian Rupee or the currencies of Nepal and Bhutan. There are also a number of other countries where the use of Cash Passport is not allowed as they are subject to US economic sanctions. If you attempt to withdraw cash or use your Card at merchants in any of these countries, your request will be declined and the reason given as 'Decline, prohibited country'. The countries currently affected by sanctions are: Cuba, Iran, Myanmar (Burma), Sudan and Syria. 7. What if my Card doesn t work at an ATM? Cash Passport should work in any cash machine, outside India, Nepal or Bhutan, displaying the MasterCard Acceptance Mark. If it doesn t, the Card may be faulty and you can get 24/7 help from Card Services, via the Global Emergency Assistance numbers. Please note, if an ATM screen prompts you to choose which account?, it is recommended that you choose the Credit option. You can only withdraw cash from an ATM up to the available balance on your Cash Passport Card (including any applicable fees) and if the amount is within the ATM s issuing limit. 8. 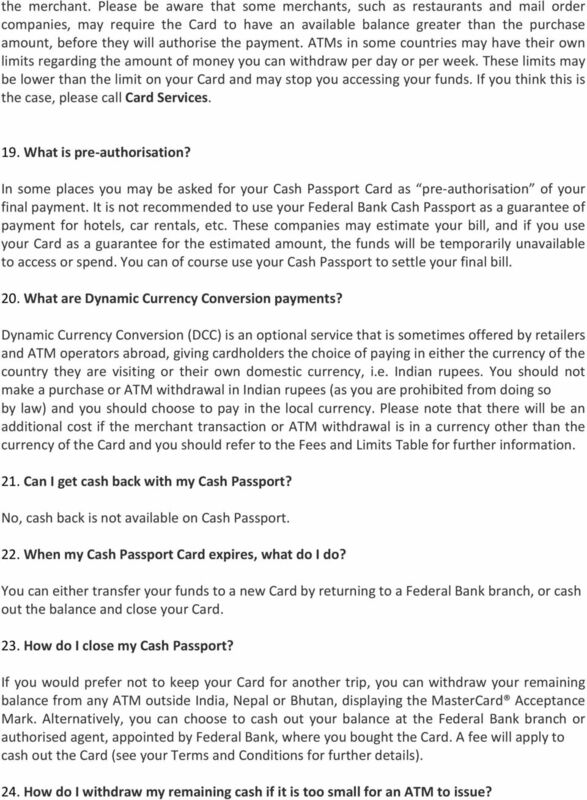 Can I use my Federal Bank Cash Passport to make online purchases? 3 You can use your Cash Passport to shop online (within the limits and restrictions of your Card) at any merchant that accepts MasterCard cards. For your security, you may be asked to provide the security code that s printed on the signature strip on the back of the Card. 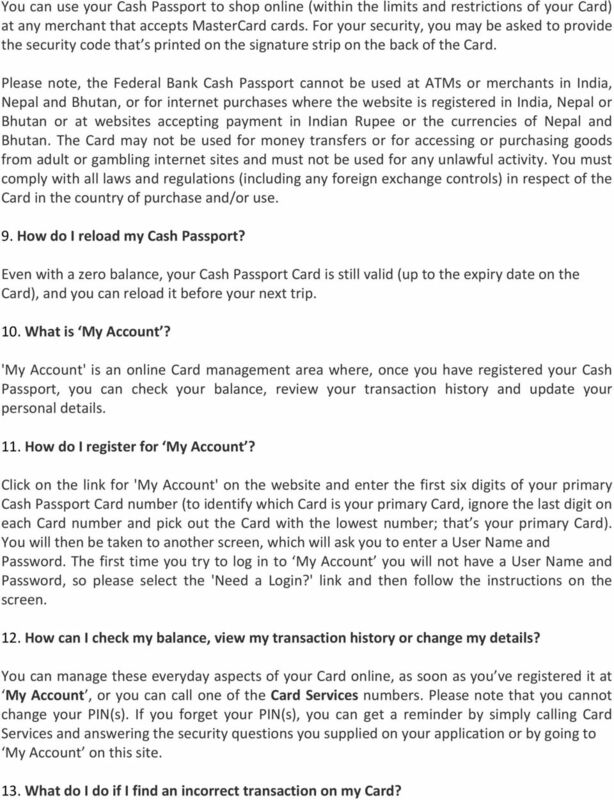 Please note, the Federal Bank Cash Passport cannot be used at ATMs or merchants in India, Nepal and Bhutan, or for internet purchases where the website is registered in India, Nepal or Bhutan or at websites accepting payment in Indian Rupee or the currencies of Nepal and Bhutan. The Card may not be used for money transfers or for accessing or purchasing goods from adult or gambling internet sites and must not be used for any unlawful activity. You must comply with all laws and regulations (including any foreign exchange controls) in respect of the Card in the country of purchase and/or use. 9. How do I reload my Cash Passport? Even with a zero balance, your Cash Passport Card is still valid (up to the expiry date on the Card), and you can reload it before your next trip. 10. What is My Account? 'My Account' is an online Card management area where, once you have registered your Cash Passport, you can check your balance, review your transaction history and update your personal details. 11. How do I register for My Account? Click on the link for 'My Account' on the website and enter the first six digits of your primary Cash Passport Card number (to identify which Card is your primary Card, ignore the last digit on each Card number and pick out the Card with the lowest number; that s your primary Card). You will then be taken to another screen, which will ask you to enter a User Name and Password. The first time you try to log in to My Account you will not have a User Name and Password, so please select the 'Need a Login?' link and then follow the instructions on the screen. 12. How can I check my balance, view my transaction history or change my details? You can manage these everyday aspects of your Card online, as soon as you ve registered it at My Account, or you can call one of the Card Services numbers. Please note that you cannot change your PIN(s). If you forget your PIN(s), you can get a reminder by simply calling Card Services and answering the security questions you supplied on your application or by going to My Account on this site. 13. What do I do if I find an incorrect transaction on my Card? 5 the merchant. Please be aware that some merchants, such as restaurants and mail order companies, may require the Card to have an available balance greater than the purchase amount, before they will authorise the payment. ATMs in some countries may have their own limits regarding the amount of money you can withdraw per day or per week. These limits may be lower than the limit on your Card and may stop you accessing your funds. If you think this is the case, please call Card Services. 19. What is pre-authorisation? In some places you may be asked for your Cash Passport Card as pre-authorisation of your final payment. It is not recommended to use your Federal Bank Cash Passport as a guarantee of payment for hotels, car rentals, etc. These companies may estimate your bill, and if you use your Card as a guarantee for the estimated amount, the funds will be temporarily unavailable to access or spend. You can of course use your Cash Passport to settle your final bill. 20. What are Dynamic Currency Conversion payments? Dynamic Currency Conversion (DCC) is an optional service that is sometimes offered by retailers and ATM operators abroad, giving cardholders the choice of paying in either the currency of the country they are visiting or their own domestic currency, i.e. Indian rupees. You should not make a purchase or ATM withdrawal in Indian rupees (as you are prohibited from doing so by law) and you should choose to pay in the local currency. Please note that there will be an additional cost if the merchant transaction or ATM withdrawal is in a currency other than the currency of the Card and you should refer to the Fees and Limits Table for further information. 21. Can I get cash back with my Cash Passport? No, cash back is not available on Cash Passport. 22. When my Cash Passport Card expires, what do I do? You can either transfer your funds to a new Card by returning to a Federal Bank branch, or cash out the balance and close your Card. 23. How do I close my Cash Passport? If you would prefer not to keep your Card for another trip, you can withdraw your remaining balance from any ATM outside India, Nepal or Bhutan, displaying the MasterCard Acceptance Mark. Alternatively, you can choose to cash out your balance at the Federal Bank branch or authorised agent, appointed by Federal Bank, where you bought the Card. A fee will apply to cash out the Card (see your Terms and Conditions for further details). 24. How do I withdraw my remaining cash if it is too small for an ATM to issue? 6 For full details of cashing out or closing your Cash Passport Card, click here. 25. Do I receive paper statements? We don t provide paper statements, but you can always view your transactions and statements securely by visiting My Account online, and print those details at your convenience. CASH PASSPORT. Prepaid MasterCard Currency Card. User Guide. Effective, 1 December 2015, the Travel Money Card Product Disclosure Statement and Conditions of Use dated 25th October 2014 are amended as follows. Card Standard Account Fees Credit cards Card fees MasterCard or VISA Classic 21.00 p.a. Visa and MasterCard when taken together Additional Cards First additional card Second and subsequent additional card.